In mobility, usability reigns supreme. Visage has taken special care to develop Visage Ease Pro as a native iOS app. That means Visage Ease Pro has been optimized exclusively for iOS devices, taking full advantage of multi-touch gestures, and the familiar form factor and user experience typical of iPads, iPhones, and iTouch devices. Visage Ease Pro has been designed to provide a simple, optimal user experience, with gestures, controls, icons, and site navigation architected to leverage the strengths of iOS and provide an enjoyable, inherently familiar experience to users. Application familiarity lends itself to ease of use and long term usability, increasing end user adoption levels with zero to minimal need for end user training, end user documentation and/or end user mobile support. Some innovative examples of Visage Ease Pro features that take advantage of the simplicity and familiarity of iOS, include support of iOS Push Notifications, Image Attachment and Voice Memos. In fact, each of the features of Visage Ease Pro, to include ease of initial download and updates from the Apple iTunes App Store, has been designed with optimal usability in mind, creating loyal users and fostering high radiologist and referring physician satisfaction. Visage Ease Pro is the first and only native iOS app with FDA clearance for mobile diagnostic interpretation (except mammography) that is a core component of an enterprise imaging platform (Visage 7) designed for the diagnostic interpretation and clinical access of all modalities, representing millions of imaging studies per year. Visage Ease Pro is a native app optimized for iOS, and is a free download from the Apple iTunes App Store. Visage Ease Pro is a native capability of the Visage 7 Enterprise Imaging Platform and does not require separate server(s) or administration. Visage Ease Pro enables authorized users to attach photos and images from their iOS devices to imaging studies managed by the Visage 7 Enterprise Imaging Platform. 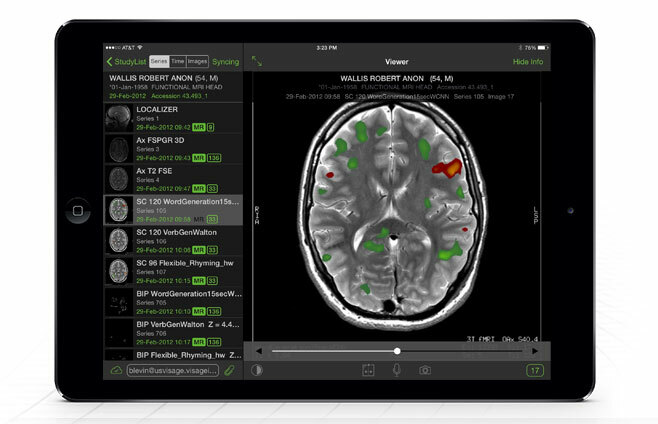 Visage Ease Pro enables authorized users to attach voice memos recorded from their iOS devices to imaging studies managed by the Visage 7 Enterprise Imaging Platform. Visage Ease Pro sync status enables authorized users to manage their mobile cache, as well as attachment uploads via graphical user interface controls. Visage Ease Pro supports protocol handler integration, enabling novel app-to-app integration, for example, to mobile EHR and portal apps. Visage Ease Pro is inherently intuitive, requires no advance training, with only a username, password, and server address required for imaging results access. Simple, fast access to images, with gesture-based, one-click scrolling, pan, window/level (W/L), zoom, DICOM overlay, and CINE controls. All image controls are all active and available even when images are in CINE mode. For multi-series studies, double-tap on either side of the image to advance to the next/prior image series. Visage Ease Pro enables users to locally cache imaging studies, based on user-definable criteria. Caching is a convenient capability for locations and geographies where network or cellular access is unavailable or highly variable. User-defined study search queries enable rapid access to studies users are most interested in viewing. Visage Ease Pro supports Apple iOS Push Notifications, alerting users when new studies at the Visage 7 server match study search criteria saved with push notifications activated. REQUEST a TEST DRIVE. Grab your iPad. Go. Learn more. Request a test drive of Visage Ease Pro, and experience the freedom of interpretation.